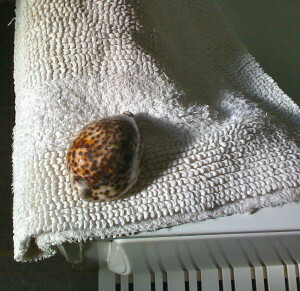 This lovely cowrie shell was collected on Durban beach a long time ago, when Granny was a girl. She treasured it. She gave away all her earthly belongings before she died. She was bed-ridden, on a high-care ward, dying from old age, metastatic bowel cancer, and had had several strokes. She was 89. The family gathered round, grateful for her life and laughter. We held her hand, she sucked a teaspoon of yogurt. Everything had been said. Her life was spent. So was her money. She had nothing left to give. And she was happy with that. The oldest daughter clutched the crumpled papers. We spread them out and laughed. Granny had planned her funeral. Get the retired vicar. These are the hymns to sing. And afterwards, tea and cake in the church hall. But not Mrs So-So’s cake, because she can’t bake! Spread my ashes in the sea at Doonside. What a joyous occasion Granny’s funeral was. The cakes were especially delicious. I took her ashes into the sea at Doonside. The family sat on the rocks around the small inlet. The sea came in, and took her away. The seagulls mewed across the sky. Perfect. The shell belonged to Mom after that. And now it belongs to me. It lives in my bathroom, slightly cracked, but intact. I hold it to my ear, and I can hear those waves. The generations of women who have treasured this shell. The sea shell whispers to me. This is a post to celebrate Dying Matter Awareness Week 12-18 May 2014. Find out more here. Start a conversation.